I've got a treat for you today! (Do I say that a lot?) My parents have come up with a limited edition star. I'd like to say they came up with it especially for Once Upon a Thread, but I'm not entirely sure that's true. Either way, they are giving away one of their giant button stars away to one of you! And, ask anyone who has ever opened their letterbox to find something from them, it is the most delightful thing to get in the mail, one of their perfectly executed wrapped boxes. Go ahead. Ask. Those buttons would have had a different life if they were living with me, but this way, you get to see them every single day, hanging up somewhere to brighten your day. Fun! ❍ We'll keep it simple. Leave a comment. Do you love big buttons, too? ❍ Please OH please leave an email if it's not linked to your profile. ❍ You are welcome to email me with an entry if you're unable to leave a comment. Then we can chat. 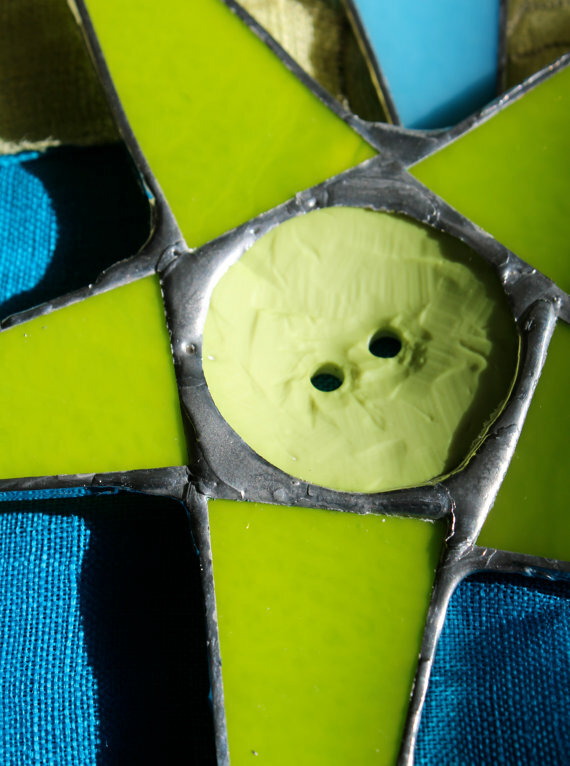 About big buttons, and other such irresistible sewing accoutrements. ❍ I'll announce a winner Monday. I love Ashley's stars, but don't have one from your parents. I would love to add it to my collection! What a clever idea. I'd love to have a big button star! You know those extra buttons that come with shirts? Yeah, I don't leave them with the shirts - I have a button bin for all craftiness that might come along! I love ALL buttons. Big, small, pretty, ugly. I don't care. Ooooo! So pretty! Love the colors and I love buttons too - makes for a perfect star. And I'm just saying, but either one of those colors goes perfect with my living room! how lovely! Just had a poke around their shop, such fabulousness. thanks for the chance! I love non-symetrical stars like these and it would go great in my office/sewing room. Beautiful!! What a great window accessory! Oh my gosh, those are gorgeous!! What a lovely giveaway... thanks! pretty! i love buttons! and stars! and button stars! oh my! the perfectness of that big button in the middle! I'm not sure I love big buttons as much as you do, but then who can? These stars are beautiful though and I would love to have one in my home! Oh, I love those stars! I do love buttons! My collection is rather sad at this stage but I expect it to grow as the years go by. I know I would love to see one of those gorgeous stars hanging in my kitchen window. Very lovely! I have bought the stars for many different people. I have not gotten one for myself though. And the packaging is always beautiful! They are beautiful as always. I love your dad's stars. Big buttons are just a bonus. Adorable! I would love to win it! I love buttons! And these stars are just lovely. Sign me up! Buttons!! How awesome, fingers crossed! I love those! And I must say, I have ordered from your parents several times now and they do not disappoint. I seriously wish I could order a package from them a month, just for the fun of opening it! And speaking of OUT and books-have you ever read Heckedy Peg? It is pretty great. And Miss Rumphius. And, my most favorite, The Oxcart Man. Those are some PRETTY great reads. whoops. I guess I would need an email. Beautiful! I love those colors. I love big buttons and I love unique buttons! I do love big buttons! I also really love these stars, they are so beautiful! I love big buttons and I cannot lie! I love your parents' stars and I love buttons, so I would loooooove this button-star ! I do love big buttons, and your parent's stars! Absolutely beautiful! they are the prettiest button stars around..thank you for the chance to win.. I love my collection and am always on the look out for more. I have been collecting them since I was a child. The hard part now is letting them go when I use them on an outfit that I am selling. But I want to share the love and what is the point of a lot of buttons that sit in jars they must be seen and loved. I would dearly love to receive a perfectly wrapped package. Thanks for the giveaway! I love buttons, and I think those stars are wonderful! Thanks for the giveaway!! I love buttons and other notions, they're so much fun!! All that is missing from my sewing room window is a star that sparkles during the day. What a coincidence! LOVE big buttons! And stars! they look fabulous. Thank you. I always LOVED those starts! And I love big buttons. I just did a spring jacket with 10 of them on it. Yes please. I love this stars already, so add a button and I'm over the moon! I haven't met a button I didn't like. I love, love, love your parent's stars. My first stars were for Christmas but they hang year-round in my house because they are just too pretty to pack away with the ornaments! They also make super teacher gifts at Christmas. The button stars look as lovely as I would expect from your parents. I hope I win! Love buttons! Love Love your star!! I love those stars and the buttons are awesome! beautiful buttons, i would love for them to brighten our house. These are so neat! Tell your parents they are very talented :) I have been wanting one ever since I read your post about the neatest one they ever made - the Where's Waldo? star! Soooo cool! Those are absolutely beautiful! Big buttons are fun. Heck, from the size of my button box, I just plain love buttons! Yes! I love buttons too, of course!! Absolutely LOVE big button! Your family is so awe inspiring.. Your dads stars are FABULOUS!!!! I love these stars. And the button is so charming. I pretty much am a sucker for buttons. I'm obsessed with buttons and with their stars, as well as your blog! I would LOVE to win! Awesome! Oh, these are beautiful! (But of course, they always are...) How fun! I love buttons! And those colors are beautiful! 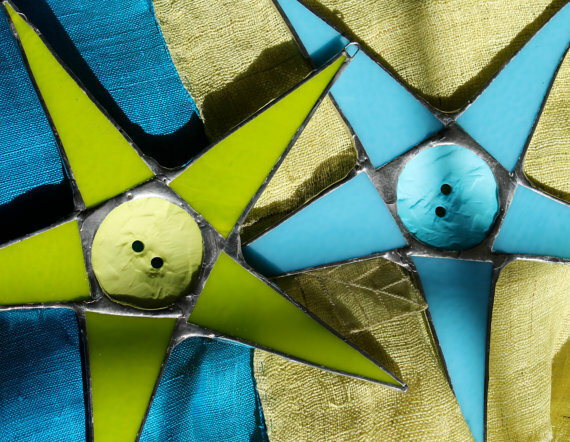 Love buttons of all sizes, but LOVE your parents' stars even more. Thanks for the chance to win! LOVE. LOVE LOVE. LOVE LOVE LOVE. Cant emphasise just how gorgeous they are and how much I would love to be the proud owner of a button with such character and uniqueness. The mind boggles over what to do with them and how difficult it would be to narrow the choices down to one single project! Perhaps I could do a timeshare style of useage whereby they can be a part of many many projects! Hee Hee!!! THanks for the chance to win one, Emma. Oooooh....I LOVE the button stars! I want! I want! They really do know how to put together a parcel. I was giddy when I openned up my parcel of cotton tape recently. They even put a little thank you card in there. So personal and so creative. Love the button stars! I have been admiring your parents' shop for a while - everything is so pretty it's hard to decide where to start! Love big buttons! If I win I am totally sporting the green star in my living room window and my daughter will have the blue in her room since it's her favorite color. They are so cute! I DO love big buttons, in fact I have those exact same buttons! Perfect colors! I love these. Buttons are the star of this show, yes? :-) Love them. Love stars. Love buttons. Love button stars! I was JUST telling my mom about these stars yesterday! YES, I like big buttons! But who doesn't, really?! I've loved buttons forever. I remember playing with my mom's collection while she sewed when I was a little girl. I now have my great grandmother's, grandmother's, mom's and my own button collection. Some are so hard to use! ---like the red vinyl ones cut from the cuffs from the matching rain coats me and my sisters wore. Love the stars your parents make and am so curious to see their beautiful packaging! So cute!! Who doesn't love stars? And buttons? And button stars?!? My sewing area seems to be the last room on the list to be organized after this move. Being chosen would surely motivate me to quickly finish the rest of my home so that my sewing machine and I can reunite under a perfect button star! Your dad's stars are stunning. Every time I go to their shop to choose I get overwhelmed by so much sparkle. The button star is a creative addition to the line-up! Don't all makers love buttons?! I have a big jar and many of our cast-off shirts and dresses are cast away sans buttons! Thanks to you and your folks for the chance to win! I see your creativity began long before you but continued with you. So nice you have such creative parents. Would love the chance to win! Thank you. I love your dad's stars. Love the buttons! Would love to win one, but if not are they available to purchase? i love these! this would look so pretty in my sewing room. I hope I win! i've been considering getting a couple to hang in my windows, but since something always shows up, i haven't bought any yet. I love big buttons but do not have many. these are beautiful!!! who doesn't love buttons of any size? and, i love the colors of those stars! These buttons are fab! I'd love To have one on display somewhere.... am trying to think how and where! maybe as a necklace so I can show it off?! Thanks for the giveaway! in love with buttons & Knudsen stars so this is a perfect combination. oh, and they happen to be in the most perfect colors! I have been eyeing these stars your parents make for quite some time now! I would LOVE one, and I would also love to see this packaging! You have the sweetest parents in the world! I know that your mother was taught well by your grandmother, I loved her too. Their stars have a very special place in my heart. I was given my first star by my mother. and the last star I purchased was the gold star at mothers day for my mother. Now two weeks latter that star sits at my mothers death bed as a special reminder of the love that families share. Thank you for a great heritage of families that we share. I would love this star....so cool!! I'm often asked by a certain friend of ours if I do much sewing while in the bathroom.. because I even have a collection of beautiful buttons displayed there! Love them. And love those stars! Need to purchase some if I don't win.. or even if I do! Thank you for the chance! I've admired their stars for a while. They're all soooo beautiful! Such a talented family! Oh, my love of buttons. It is all Mom's fault! If I had more time I would tell you about the button jars... I love buttons!! I love buttons! Big and small. In fact one of our favorite stories is The Button Box. I love looking at all those buttons just imagining. How fun to have it in the middle of a star! I love the stars! Thanks for hosting the giveaway. Green is my fave color. Thx for the chance! I wanted to go to the button store you went to in New York, but alas I was too busy my last time playing chaperone/tour guide/ and doing doctoral research. Who doesn't love big buttons? And green! I can't leave a yard sale or flea market without a jar full of buttons with me. I would love to welcome one of these beauties into our home. Thanks for the giveaway! I would love one of these! My maiden name is "Knopf" which in German means "Button"! I could tell you stories about how Buttons have fit into my life. Would LOVE a button star!!! Thanks for the chance to win one! 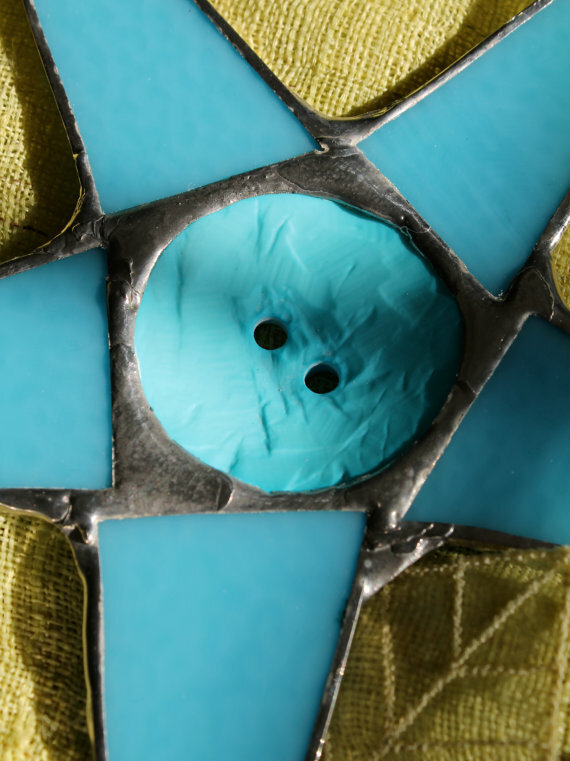 i love buttons as they remind me of my mother and grandmother and great-grandmother and all of their textile creations. what an awesome star! oh i do, most defiantly do love big and fun buttons! Who doesn't love buttons? These stars are beautiful. I absolutely love their stars! They are so wonderful (I've got a few on my wishlist!)... adding a button? That makes them even better!! Ooohhh I love buttons. But I would really LOVE to have a beautiful star!!! I love buttons and would love to hang one of those beautiful stars in my house! these are so cheeful and bright, i'd love to see on hanging in our window! We just moved and a star would look great hanging in my kitchen window. I love big buttons and those stars even more! Beautiful! I would love to win it! Those stars are neat, and I love buttons too! Handmade buttons are so folk-ish, I love them. Bought my first one at John C Campbell Folk School in North GA and I just love looking at it. Beautiful work your parents do. What gorgeous art work! That would look beautiful in my home. Thanks for chance to win. Pick me, pick me, pretty please pick me! Those stars are just gorgeous, and the addition of the button is super sweet! I'm still sad that I didn't win the Where's Waldo star your parents made! Would love to bring home this sweet button star! I think I would hang it in my office window, give me something happy to look at during the long days! Yes, I love big buttons and I would love to win a star! I have the perfect place for it! Button Stars? Love, love, love! Your family is just so amazing! Am I too late? I love it! I love your parents' stars and have a whole bunch of them! I need a button one to add to the collection!!! Oh I hope I am not too late?????? I love that big button, and LOVE buttons too. Whenever I see them, they are just a lot of fun!